Some of Richard Barrett’s most memorable moments at Southern Illinois University Carbondale include failing an accounting class and singing in the university choir. When Barrett looks back, though, he recognizes that his failures and victories as a Saluki have contributed to his long, successful career in finance and investments. Fifty years after graduating from SIU with a bachelor’s degree in business administration, the Chicago native returned to his alma mater’s College of Business as a highly distinguished executive in residence. For two days during the first week of April, the Class of ’66 alumnus led classroom lectures, conducted mock interviews, reviewed student résumés and shared his professional experience with students, all while providing them with valuable wisdom during his lecture time and in networking events such as breakfasts and luncheons. Barrett, managing director of investments at The Barrett Group of Wells Fargo Advisors, is one of four representatives of the Executive in Residence (EIR) program of the College of Business for the spring 2016 semester. His fellow appointee, Diane Schumacher, a former senior vice president and general counsel of Cooper Industries Inc., visited the college in March to share her time and expertise with the business students. Reina Mejia, chief commercial officer of Citibank in Honduras (April 21-22) and Ken Hannah, chief financial officer of Caleres, formerly Brown Shoe Co. (April 27-28), are both following suit in the last two weeks of the month before the spring semester concludes with the final exams in mid-May. The EIR program connects business students with highly distinguished and accomplished alumni of accounting, finance, marketing and management. It was re-established in fall 2015 and has received positive feedback from students and the selected executives, as well as faculty and staff. After earning his degree in 1966, Barrett began his career at the investment firm F.I. DuPont in Chicago. After three years he moved his financial practice to Blunt Ellis & Loewi, a predecessor firm of Wells Fargo Advisors – and he never looked back. “I’ve been with my company for 46 years,” he said. Barrett, a believer in setting specific goals and pursuing dreams so workers can find happiness in their chosen professions, credits his outstanding career to his staff members and SIU – and, most importantly, his family. And yet, as his long list of accolades and recognition as a leading financial advisor reveals, Barrett has more reasons to be proud. Along his path to success, Barrett was recognized for his production and for providing outstanding client service as a member of the firm’s Chairman Circle of Excellence. 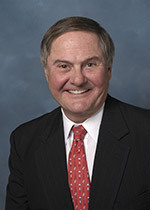 He also has been honored with the Wachovia Way Award, featured in the Chicago Tribune’s “Ask the Expert” column and is a member of the SIU College of Business Hall of Fame. He is a graduate of the Securities Industry Association Institute held at The Wharton School and has lectured at the University of Illinois. In 2009, his name was added to the list of Barron’s Top 1,000 Advisors. Despite those great achievements, Barrett has remained a very humble, approachable and down-to-earth person who is known for his superior work ethic and positive attitude. This ability certainly helped him to get his overall message across to the CoB students during the various networking events such as breakfast and luncheons or during class. Barrett was handpicked for the EIR program by Jason Greene, the college’s interim dean and Henry J. Rehn Professor Finance. He gladly accepted his EIR role with the goal to pass on his knowledge to the students – and to help them become equally outstanding professionals and leaders. To accomplish this goal, Barrett shared a few of his secrets for success: long hours, effective communication and consistency. The latter is easily accomplished with communication skills that are, according to Barrett, a dying virtue and lost skill in our fast-paced computer-driven society. While acknowledging the competitiveness of today’s job market, Barrett believes it doesn’t take much to give 100 percent. “Everything is between your ears, your attitude, your projection and putting in the time,” Barrett said.